The investigation was conducted on client-owned moderately arthritic dogs with two objectives: (i) to evaluate therapeutic efficacy of type-II collagen (UC-II) alone or in combination with glucosamine hydrochloride (GLU) and chondroitin sulphate (CHO), and (ii) to determine their tolerability and safety. 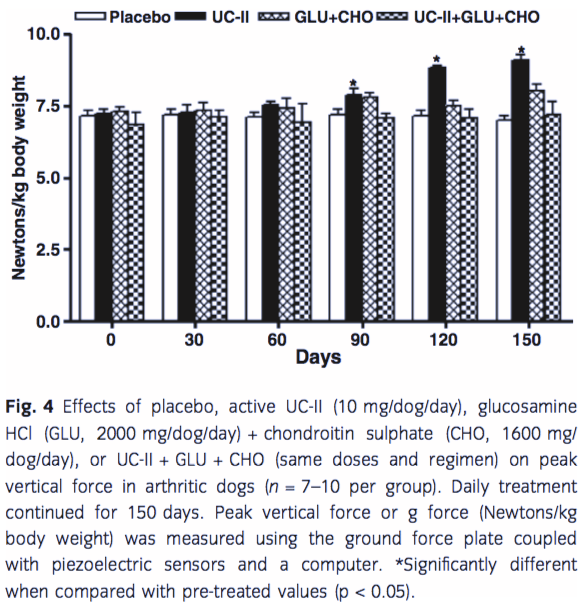 Dogs in four groups (n = 7–10), were treated daily for a period of 150 days with placebo (Group-I), 10 mg active UC-II (Group-II), 2000 mg GLU + 1600 mg CHO (Group-III), and UC-II + GLU + CHO (Group-IV). On a monthly basis, dogs were evaluated for observational pain (overall pain, pain upon limb manipulation, and pain after physical exertion) using different numeric scales. Pain level was also measured objectively using piezoelectric sensor-based GFP for peak vertical force and impulse area. Dogs were also examined every month for physical, hepatic (ALP, ALT and bilirubin) and renal (BUN and creatinine) functions. Based on observations, significant (p < 0.05) reduction in pain was noted in Group-II, III, and IV dogs. Using GFP, significant increases in peak vertical force (N/kg body wt) and impulse area (N s/kg body wt), indicative of a decrease in arthritis associated pain, were observed in Group-II dogs only. None of the dogs in any group showed changes in physical, hepatic or renal functions. In conclusion, based on GFP data, moderately arthritic dogs treated with UC-II (10 mg) showed a marked reduction in arthritic pain with maximum improvement by day 150. UC-II, GLU and CHO operate through different mechanisms of action, and were well tolerated over a period of 150 days. According to the American Veterinary Medical Association, arthritis affects approximately 20% of the dog population (72 114 000) in the United States. Among all forms of arthritis in dogs, osteoarthritis (OA) is the most common. OA is an inflammatory joint disease characterised by degeneration of the cartilage, hypertrophy of bone at the margins, and changes in the synovial membrane, which eventually results in stiffness of joints, lameness and pain (Goldring, 2000; Bellamy et al., 2001; Peat et al., 2001; CDC, 2009). Arthritic dogs usually limp and are unable to move normally. Although any breed of dogs can have OA, some breeds are more predisposed to this disease. Approximately 45% of large breed dogs, such as German Shepherds, Labrador Retrievers and Siberian Huskies are genetically predisposed for OA (Elliot, 2007). Ageing, obesity, injuries, and lack of exercise or excessive exercise appear to be additional contributing factors to OA. As in humans (Eaton, 2004), approximately 75% of arthritic dogs are obese, and both obesity and arthritis cause a decrease in quality of life because of associated pain (Richardson et al., 1997; Hielm-Bjorkman et al., 2003). It is estimated that each pound of body weight can exert approximately 7 pounds of pressure on joints (CDC, 2009). The approach for treatment of OA is often multifaceted and relies upon disease-modifying OA agents (Dieppe and Lohmander, 2005; Martel-Pelletier et al., 2005). The major objective of treatment is to minimise joint pain by reducing the inflammation, as well as to slow the progression of the osteopathy. The most common therapies include cyclooxygenase (COX) inhibiting non-steroidal antiinflammatory drugs (NSAIDs), such as carprofen, etodolac, deracoxib, firocoxib, meloxicam and tepoxalin (Moreau et al., 2003; Sessions et al., 2005). Chronic use of NSAIDs is linked to serious side effects, including gastrointestinal upset and bleeding, and hepatic, renal and hematopoietic dysfunctions (PDR, 1998; Lobetti and Joubert, 2000; Muhlfeld and Floege, 2005; Raekillio et al., 2006). Both aspirin and ibuprofen inhibit the activities of COX-I and COX-II, and the production of inflammatory prostaglandins, thus providing a therapeutic effect. But these drugs also inhibit the production of constitutive prostaglandins, causing severe side effects, such as GI bleeding and renal damage (Matteson, 2000). Alternative remedies to COX inhibitors include therapeutic diets, natural herbs and nutraceuticals, in addition to physical exercise, massage, acupuncture, hydrotherapy, nutrition and weight loss (Christensen et al., 2005; Schoenherr, 2005; Roudebush, 2006; Messier et al., 2007; Lee et al., 2010). Because of the growing number of people and animals suffering from OA and the severe side effects of COX inhibitors, there is a great need for safer medications to alleviate the symptoms of arthritis. In the recent past, nutraceuticals, such as glucosamine and chondroitin have gained enormous popularity for their anti-arthritic use in humans and animals, but their effect is insignificant (Reginster et al., 2001; Goggs et al., 2005; Neil et al., 2005; Clegg et al., 2006; McCarthy et al., 2006; Messier et al., 2007; Lee et al., 2010; Wandel et al., 2010). Recently, we have demonstrated that undenatured type-II collagen (UC-II) from chicken sternum markedly reduced pain in dogs and thereby improved their quality of life (Deparle et al., 2005; D’Altilio et al., 2007; Peal et al., 2007). Pain was assessed by observation in previous studies. 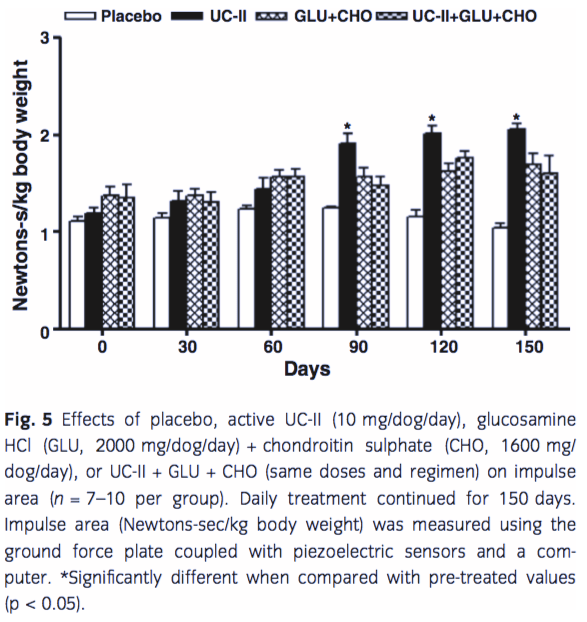 The purpose of this study was to assess pain quantitatively by using a ground force plate (GFP) coupled with piezoelectric sensors, in addition to pain measured by observation, in moderately arthritic dogs treated with UC-II alone or in combination with glucosamine hydrochloride and chondroitin sulphate. 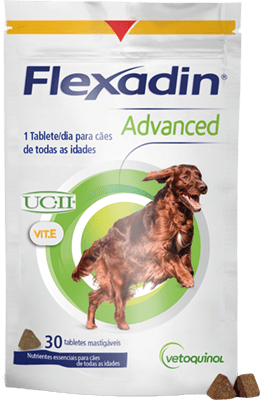 These dogs were also evaluated for tolerability and safety of UC-II, glucosamine and chondroitin given singly or in combination. A group of adult, privately owned arthritic dogs (each weighing over 40 pounds) were used in this investigation. These dogs had signs of arthritis, such as joint stiffness, lameness and pain at the level of moderate severity. These dogs were experiencing difficulty in getting up or down and walking. Arthritic dogs having any other serious disease (such as hepatic or renal) or complication (such as tumour, etc.) were excluded from the study. Throughout the study, dogs remained with their owners, and therefore Institutional Animal Care and Use Committee (IACUC) approval was not required. Owner consent was obtained before initiation of any experiments. Type-II glycosylated undenatured chicken sternum cartilage (UC-II) in capsule form (40 mg providing 10 mg active UC-II) used in this investigation was provided by InterHealth Nutraceuticals (Benicia, CA, USA). UC-II is manufactured in a GMP facility at a low temperature, which preserves its undenatured form and biological activity. Placebo (microcrystalline cellulose), glucosamine HCl (GLU) and chondroitin sulphate (CHO) were also provided as capsules by InterHealth Nutraceuticals. Client-owned moderately arthritic dogs, randomly divided into four groups (n = 7–10), received daily treatment as follows: placebo (Group-I), 10 mg active UC-II (Group-II), 2000 mg GLU + 1600 mg CHO (Group-III), and 10 mg active UC-II + 2000 mg GLU + 1600 mg CHO (Group-IV) for a period of 150 days. None of the dogs received any treatment or supplement for 3–4 weeks before the study or during the study period. The study was conducted double-blinded, that is, the investigators or owners had no knowledge of the capsule content. The dogs were evaluated for overall pain, pain upon limb manipulation, and exercise-associated lameness on a monthly basis for a period of 150 days. Overall pain was measured as a general gross observation, which included trouble in standing after sitting, or trouble in sitting after standing, vocalisation, crying and so on. Results were graded on a scale of 0–10: 0, no pain; 5, moderate pain; and 10, severe and constant pain. Pain upon limb manipulation was evaluated by animals’ vocalisation or other observations of pain during the extension and flexion of all four limbs for a period of several minutes. Results were graded on a scale of 0–4: 0, no pain; 1, mild; 2, moderate; 3, severe; and 4, severe and constant. Lameness was measured after physical exercise for gross observations, which included limping, holding limb up, rigidity of limbs and so on. Signs of pain and lameness were also noted on a scale of 0–4: 0, no pain; 1, mild; 2, moderate; 3, severe; and 4, severe and constant. Severity of pain during various activities, such as standing from sitting, sitting from standing, playing and vocalisation, and during extension and flexion of limbs was the basis for gradation. Gross observations were evaluated and recorded monthly using a questionnaire regarding the overall activity and the improvement of the arthritic symptoms. Furthermore, overall performance of individual groups was assessed, which included running, participation in jogging activities, movement up and down stairs, comfort ability in moving from sitting to standing position(s), cheerful attitude toward playing and jumping, and so on. Detailed criteria for the measurement of pain by observations are provided in our recent publications (Deparle et al., 2005; D’Altilio et al., 2007; Peal et al., 2007) and also briefly described in Table 1. Ground Force Plate (Kistler Instrument, Amherst, NY, USA) was utilised to quantitatively measure the lameness-associated pain in each leg of every dog used in this study. The Kistler’s GFP system consists of plates, lasers and a computer. The GFP measures two major parameters: (i) peak vertical force or g force (N/kg body weight) and (ii) impulse area (N s/kg body weight). On a monthly basis, each dog was evaluated for pain level measured by observations and quantitatively by the GFP. On a monthly basis, dogs were given a physical evaluation (body weight, body temperature and pulse rate) and serum samples were examined for hepatic (ALP, ALT and bilirubin) and renal (BUN and creatinine) functions. The data of pain presented in Figs 1–5 are means ± SEM. Statistical significance of difference was determined by analysis of variance (ANOVA) coupled with Tukey–Kramer test using the NCSS (Number Cruncher Statistical System) 2000 statistical system for Windows (Kaysville, UT, USA). Differences with p < 0.05 were considered statistically significant. 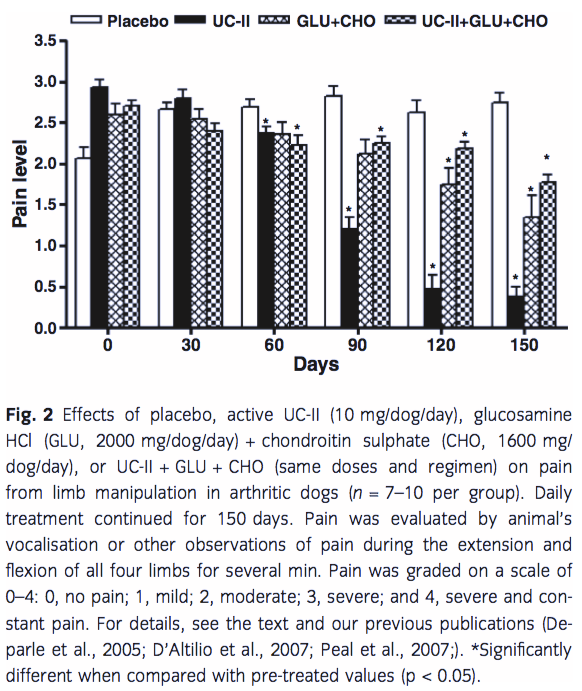 Data of pain level measured by observations (overall pain, pain after limb manipulation, and pain after physical exertion) in arthritic dogs receiving placebo, UC-II, glucosamine (GLU) + chondroitin (CHO), or a combination of UC-II + GLU + CHO, are shown in Figs 1–3. Dogs in the placebo group (Group-I) exhibited no significant change in arthritic condition at any time during the course of treatment. Dogs receiving UC-II (Group-II) showed significant reduction in pain by day 60, but the maximum reduction in pain was observed on day 150 (overall pain, 81%; pain after limb manipulation, 87%; and pain after physical exertion, 90%). 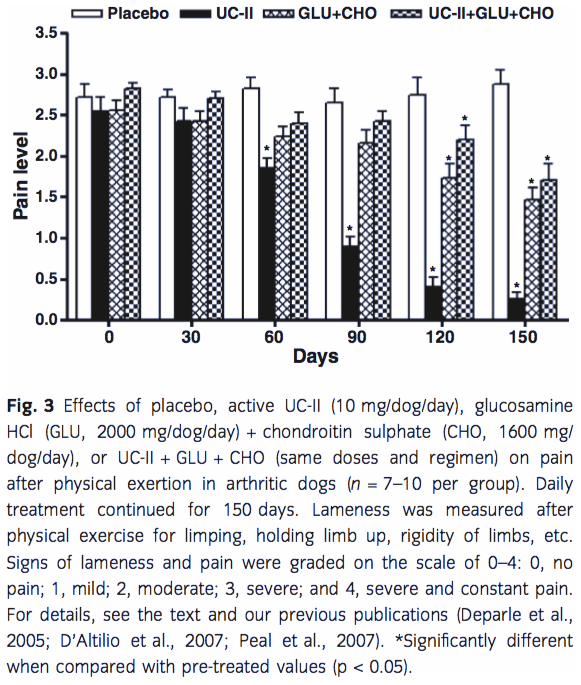 Group-III dogs receiving GLU + CHO exhibited significant reduction in pain by day 90 with maximal effects on day 150 (overall pain, 51%; pain after limb manipulation, 48%; and pain after physical exertion, 43%). Dogs given a combination of UC-II + GLU + CHO (Group-IV) showed significant and maximal pain reductions (36%, 34% and 40%, correspondingly) on day 150 compared to the pre-treated value on day 0. In UC-II-treated dogs (Group-II), GFP assisted values of peak vertical force (N/kg body wt) and impulse area (N s/kg body wt) were significantly increased (p < 0.05) as early as day 90 (Figs 4 and 5). This was indicative of a decrease in arthritis associated pain. The values were maximally elevated (120% and 142%, respectively) when measured on day 150. Values of these parameters remained significantly indifferent in other groups throughout the course of treatment. None of the dogs receiving dietary supplements showed any signs of adverse effects. There were no significant changes in any parameters of physical exam or any markers of liver or renal functions during the course of this investigation (data not shown, as they are already published in Deparle et al., 2005; D’Altilio et al., 2007). The present investigation evaluated type-II collagen (UC-II) alone or in combination with glucosamine (GLU) and chondroitin (CHO) for therapeutic efficacy in terms of pain reduction in moderately arthritic dogs. GFP was used to measure the level of pain quantitatively. The present findings revealed that UC-II provides significant reduction in pain associated with OA in dogs, as evidenced by significant increases in the values of peak vertical force and impulse area. Although significant elevations in peak vertical force and impulse area were noted as early as 90 days, maximal increases occurred after 150 days of treatment with UC-II (Figs 4 and 5). UC-II in combination with GLU and CHO did not provide significantly more amelioration in pain compared to UC-II alone. As expected, results of the GFP were proven to be more accurate and confirmed our previous data of pain measured by observations (Deparle et al., 2005; D’Altilio et al., 2007; Peal et al., 2007). In previous studies, UC-II has been shown to be effective in ameliorating pain associated with arthritis in humans (Trentham et al., 1993; Bagchi et al., 2002; Crowley et al., 2009), dogs (Deparle et al., 2005; D’Altilio et al., 2007; Peal et al., 2007) and horses (Gupta et al., 2009). In the case of OA, UC-II can promote a reduction in inflammation. UC-II reacts with the body’s immune system to improve crippling signs and symptoms of arthritis. Type-II collagen is the principle structural protein found in cartilage and is responsible for its tensile strength and toughness (Bagchi et al., 2002). Type-II collagen is one of the primary connective tissues of the body, providing flexibility and support to bone joints. UC-II functions through a process called oral tolerisation, which takes place in the small intestine where food is being absorbed (Trentham, 1998). Oral tolerance can be induced by two major mechanisms, bystander suppression and clonal anergy, depending on the dose of an antigen that is presented. Throughout the small intestine, there are patches of gut-associated lymphoid tissue (GALT). Within the GALT can be found the tissue that consists of nodules (Peyer’s patches). The Peyer’s of patches contain organised assemblages of T and B lymphocytes, macrophages, and dendritic cells and are the primary area within the gastrointestinal tract where immune responses are generated (Weiner, 1997). Bystander suppression is the form of oral tolerance achieved by presenting small amounts of antigen to the GALT, which in turn generates a T-cell response. After the antigen (i.e. UC-II) is consumed, regulatory Th2 and Th3 cells migrate from the GALT through the lymphatic system and then into peripheral circulation. When they encounter an antigen similar to that which was ingested, they secrete cytokines, including TGF-beta, IL-4 and IL-10, resulting in the down regulation of activated helper Th1 cells. These activated helper T cells are, in part, involved in producing the inflammation and destruction of collagen in arthritis. Clonal anergy is an another mechanism by which an orally administered protein can induce a down regulation of an immune response. But this results from the ingestion of high doses of an antigen, which in turn, induces a state of unresponsiveness from overactive Th1 cells. Therefore, it appears that oral tolerance in case of UC-II is induced by bystander suppression. A small amount of undenatured type-II collagen (10 mg active UC-II) taken orally has been shown to turn off the immune response targeted at type-II collagen in joint cartilage, and adverse effects have not been noted in humans (Weiner, 1997; Trentham, 1998) or dogs (Deparle et al., 2005; D’Altilio et al., 2007; Peal et al., 2007). Similar observations were reported for horses receiving active UC-II at 120 mg/ day (Gupta et al., 2009). In essence, UC-II improves joint mobility and flexibility by preventing the immune system from attacking and damaging its own joint cartilage. GLU + CHO or UC-II + GLU+ CHO (Group-III and Group-IV, respectively) provided significant (p < 0.05) reductions in pain when assessed by observations (overall pain, pain from limb manipulation and pain after physical exertion) in moderately arthritic dogs (Figs 1–3), but the values of GFP-based parameters (peak vertical force and impulse area) remained significantly unchanged (p > 0.05). GLU is a naturally occurring compound, as it is produced in many organs of the body, but maximally in the joint cartilage, where it is one of the major components involved in the formation of critical lubricants and shock absorbers necessary to maintain and restore healthy joint performance. GLU is an intermediate substrate in the synthesis of the ground substance (non-collagen portion) of cartilage. Studies suggest that GLU helps relieve pain by enhancing proteoglycan synthesis, which is impaired in OA cartilage (Hooper, 2001). It needs to be pointed out that longterm use of GLU can cause hyperglycaemia and thereby may limit its use in diabetic patients. CHO sulphate aids in keeping cartilage tissue from dehydrating, provides elasticity, and assists in cushioning impact stress. Some studies suggest that supplementation with CHO sulphate can significantly reduce joint pain (Neil et al., 2005; Sawitzke et al., 2008; Hochberg, 2010). CHO sulphate may actually help the body to repair damaged cartilage and help restore joint integrity. It may protect existing cartilage from premature breakdown. Because CHO production by the body decreases with age, supplementation with this compound may be especially helpful for older dogs with arthritis. It is a common practice for GLU and CHO to be used together as they offer a greater beneficial effect than when given alone, although they work through different mechanisms of action (Reginster et al., 2001; Michel et al., 2005; McCarthy et al., 2006; Huskisson, 2008; Sawitzke et al., 2008). It is clear from the present investigation that GLU + CHO offers some beneficial effects in ameliorating pain in arthritic dogs, but the effect is not significant, as also reported earlier in humans (Clegg et al., 2006). Of course, the criteria for the selection of trials has remained so far questionable in humans and the studies have been too small in animals. So far, conclusions are not supported by the sound scientific data with regard to effects of GLU and CHO in OA in humans or animals. Based on the findings presented here and elsewhere, it can be suggested that UC-II, GLU and CHO may exert structure – modifying effects in OA, of course, they operate through different mechanisms of action. In the present investigation, it was unexpectedly observed that UC-II did not add any beneficial effect to GLU + CHO. In fact, the pain reduction was less than that observed with UC-II or GLU + CHO alone (Group-II and Group-III, respectively). It needs to be mentioned that GFP- based values of peak vertical force and impulse area were significantly (p < 0.05) increased only in UC-II treated dogs, which was indicative of significant reduction in pain associated with arthritis. 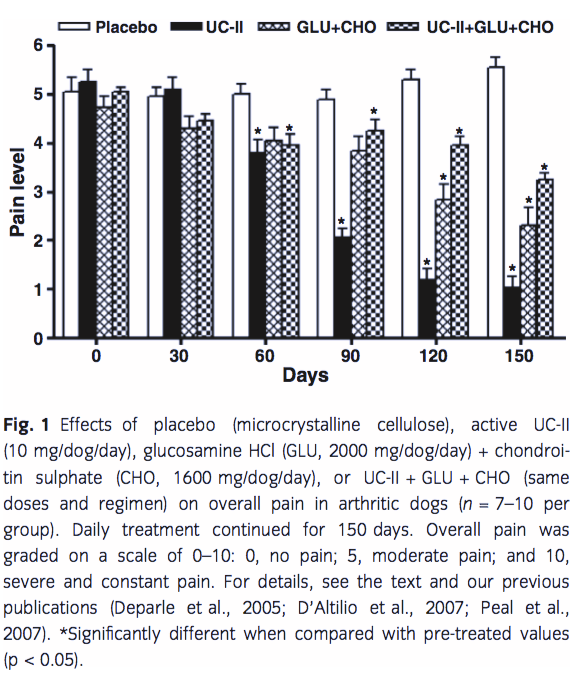 Based on GFP data, moderately arthritic dogs treated daily with UC-II (10 mg) showed a marked reduction in arthritic pain with maximum improvement seen on day 150. UC-II treatment ameliorates pain associated with arthritis, and efficacy is significantly greater than GLU + CHO. UC-II, GLU, and CHO operate through different mechanisms of action. All three supplements evaluated in this study were well tolerated and found to be safe over a 5-month period. Bagchi, D.; Misner, B.; Bagchi, M.; Kothari, S. C.; Down, B. W.; Farad, R. D.; Preuss, H. G., 2002: Effect of orally administered undenatured type II collagen against arthritic inflammatory diseases: a mechanistic exploration. International Journal of Clinical Pharmacological Research 22, 101–110. Bellamy, N.; Carr, A.; Dougados, M.; Shea, B.; Wells, G., 2001: Towards a definition of ‘‘differences’’ in osteoarthritis. Journal of Rheumatology 28, 427–430. Christensen, R.; Astrup, A.; Bliddal, H., 2005: Weight loss: the treatment of choice for knee osteoarthritis? A randomized trial. Osteoarthritis and Cartilage 13, 20–27. Clegg, D. O.; Reda, D. J.; Harris, C. L.; Klein, M. A.; O’Dell, J. R.; Hooper, M. M.; Brad, J. D.; Bingham, C. O.; Weisman, M. H.; Kackson, C. G.; Lane, N. E.; Cush, J. J.; Moreland, L. W.; Schumacher, H. R.; Oddis, C. V.; Wolfe, F.; Molitor, J. A.; Yocum, D. E.; Schnitzer, T. J.; Furst, D. E.; Sawitzke, A. D.; Shi, H.; Brandt, K. D.; Moskowitz, R. W.; Williams, J., 2006: Glucosamine, chondroitin sulfate, and the two in combination for painful knee osteoarthritis. The New England Journal of Medicine 354, 795–808. Crowley, D. C.; Lau, F. C.; Sharma, P.; Evans, M.; Guthrie, N.; Bagchi, M.; Bagchi, D.; Dey, D. K.; Raychaudhuri, S. P., 2009: Safety and efficacy of undenatured type II collagen in the treatment of osteoarthritis of the knee: a clinical trial. International Journal of Medical Sciences 6, 312–321. D’Altilio, M.; Peal, A.; Alvey, M.; Simms, C.; Curtsinger, A.; Gupta, R. C.; Canerdy, T. D.; Goad, J. T.; Bagchi, M.; Bagchi, D., 2007: Therapeutic efficacy and safety of undenatured type II collagen singly or in combination with glucosamine and chondroitin in arthritic dogs. Toxicology Mechanisms and Methods 17, 189–196. Deparle, L. A.; Gupta, R. C.; Canerdy, T. D.; Goad, J. T.; D’Altilio, M.; Bagchi, M.; Bagchi, D., 2005: Efficacy and safety of glycosylated undenatured type-II collagen (UC-II) in therapy of arthritic dogs. Journal of Veterinary Pharmacology and Therapeutics 28, 385–390. Dieppe, P.; Lohmander, L. S., 2005: Pathogenesis and management of pain in osteoarthritis. Lancet 365, 965–973. Eaton, C. B., 2004: Obesity as a risk factor for osteoarthritis: mechanical versus metabolic. Medical Health RI 87, 201–204. Elliot, D., 2007: Nutritional management of canine arthritis. Veterinary Focus 17, 43–48. Goldring, M. B., 2000: Osteoarthritis and cartilage: the role of cytokines. Current Rheumatology Report 2, 459–465. Gupta, R. C.; Canerdy, T. D.; Skaggs, P.; Stocker, A.; Zyrkowski, G.; Burke, R.; Wegford, K.; Goad, J. T.; Rohde, K. M.; Barnett, D.; DeWees, W.; Bagchi, M.; Bagchi, D., 2009: Therapeutic efficacy of undenatured type-II collagen (UC-II) in comparison to glucosamine and chondroitin in arthritic horses. Journal of Veterinary Pharmacology and Therapeutics 32, 577–584. Hielm-Bjorkman, A. K.; Kuusela, E.; Liman, A.; Markkola, A.; Saarto, E.; Huttunen, P.; Leppa¨luoto, J.; Tulamo, R. M.; Raekallio, M., 2003: Evaluation of methods for assessment of pain associated with osteoarthritis in dogs. Journal of American Veterinary Medical Association 222, 1552–1558. Hochberg, M. C., 2010: Structure-modifying effects of chondroitin sulfate in knee osteoarthritis: an updated meta-analysis of randomized placebo-controlled trials of 2-year duration. Osteoarthritis and Cartilage 18(Suppl. 1), S28–S31. Hooper, M., 2001: Is glucosamine an effective treatment for osteoarthritic pain? Cleveland Clinic Journal of Medicine 68, 494–495. Huskisson, E., 2008: Glucosamine and chondroitin for osteoarthritis. The Journal of International Medical Research 36, 1–18. Lee, Y. H.; Woo, J.; Choi, S. J.; Ji, J. D.; Song, G. G., 2010: Effect of glucosamine or chondroitin sulfate on the osteoarthritis progression: a meta-analysis. Rheumatology International 30, 357–363. Lobetti, R. G.; Joubert, K. E., 2000: Effect of administration of non-steroidal anti-inflammatory drugs before surgery on renal function in clinically normal dogs. American Journal of Veterinary Research 61, 1501–1507. Martel-Pelletier, J.; Tardif, G.; Laufer, S.; Pelletier, J., 2005: Cytokines and growth factors in the treatment of osteoarthritis: what could be the best disease modifying drugs. Current Medicinal Chemistry 4, 235–249. Matteson, E. L., 2000: Current treatment strategies for rheumatoid arthritis. Mayo Clinic Proceedings 75, 69–74. McCarthy, G.; O’Donovan, J.; Jones, B., 2006: Randomised double-blind, positive-controlled trial to assess the efficacy of glucosamine/chondroitin sulfate for the treatment of dogs with osteoarthritis. The Veterinary Journal 174, 54–61. Messier, S.; Mihalko, S.; Loester, R., 2007: Glucosamine/ chondroitin combined with exercise for the treatment of knee: a preliminary study. Osteoarthritis and Cartilage 15, 1256–1266. Michel, B. A.; Stucki, G.; Frey, D.; Vathaire, F. D.; Vignon, E.; Bruehlmann, P.; Ubelhart, D., 2005: Chondroitins 4 and 6 sulfate in osteoarthritis of the knee: a randomized, controlled trial. Arthritis Rheumatology 52, 779–786. Moreau, M.; Dupuis, J.; Bonneau, N. H.; Desnoyers, M., 2003: Clinical evaluation of a nutraceutical, carprofen and meloxicam for the treatment of dogs with osteoarthritis. Veterinary Record 152, 323–329. Muhlfeld, A.; Floege, J., 2005: COX-2 inhibitor induced anuric renal failure in a previously healthy young woman. Clinical Nephrology 63, 221–224. Neil, K. M.; Caron, J. P.; Orth, M. W., 2005: The role of glucosamine and chondroitin sulfate in treatment and prevention of osteoarthritis in animals. Journal of the American Veterinary Medical Association 226, 1079–1085. PDR, 1998: Physicians Desk Reference (PDR), 52nd edn. Medical Economics Company, Inc., Montvale, NJ. Peal, A.; D’Altilio, M.; Simms, C.; Alvey, M.; Gupta, R. C.; Goad, J. T.; Canerdy, T. D.; Bagchi, M.; Bagchi, D., 2007: Therapeutic efficacy and safety of undenatured type-II collagen (UC-II) alone or in combination with (-)-hydroxycitric acid and chromemate in arthritic dogs. Journal of Veterinary Pharmacology and Therapeutics 30, 275–278. Peat, G.; McCarney, R.; Croft, P., 2001: Knee pain and osteoarthritis in older adults: a review of community burden and current use of primary health care. Annals of Rheumatic Diseases 60, 91–97. Raekillio, M.; Hielm-Bjorkman, A.; Kejonen, J.; Salonen, H.; Sankari, S., 2006: Evaluation of adverse effects of long-term orally administered carprofen in dogs. Journal of American Veterinary Medical Association 228, 876–880. Reginster, J. Y.; Deroisy, R.; Rovati, L. C.; Lee, R. L.; Lejeune, E.; Bruyere, O.; Giacovelli, G.; Henrotin, Y.; Dacre, J. R.; Gossett, C., 2001: Long-term effects of glucosamine sulfate on osteoarthritis progression: a randomized, placebo-controlled clinical trial. Lancet 357, 251–256. Richardson, D. C.; Schoenherr, W. D.; Zicker, S. C., 1997: Nutritional management of osteoarthritis. Veterinary Clinics of North America, Small Animal Practice 27, 883–911. Roudebush, P., 2006: Pain management for canine osteoarthritis. Proceedings of the North American Veterinary Conference 20, 1007–1010. Sawitzke, A. D.; Shi, H.; Finco, M. F.; Dunlop, D. D.; Bingham, C. O.; Harris, C. L.; Singer, N. G.; Bradley, J. D.; Silver, D.; Jackson, C. G.; Lane, N. E.; Oddis, C. V.; Wolfe, F.; Lisse, J.; Furst, D. E.; Reda, D. J.; Moskowitz, R. W.; Williams, H. J.; Clegg, D. O., 2008: The effect of glucosamine and/or chondroitin sulfate on the progression of knee osteoarthritis. a GAIT report. Arthritis Rheumatology 58, 3183–3191. Schoenherr, W. D., 2005: Comprehensive nutritional management of canine osteoarthritis. Proceedings of the North American Veterinary Conference 19, 783–784. Sessions, J. K.; Reynolds, L. R.; Budsberg, S. C., 2005: In vivo effects of carprofen, deracoxib, and etodolac on prostanoid production in blood, gastric mucosa, and synovial fluid in dogs with chronic osteoarthritis. American Journal of Veterinary Research 66, 812–817. Trentham, D. E., 1998: Oral tolerization as a treatment of rheumatoid arthritis. Rheumatic Diseases Clinics of North America 24, 525–536. Trentham, D. E.; Dynesius-Trentham, R. A.; Orav, E. J.; Bagchi, M.; Kothari, S.; Preus, H. G.; Bagchi, D., 1993: Effects of oral administration of type-II collagen on rheumatoid arthritis. Science 262, 1727–1730. Wandel, S.; Ju¨ ni, P.; Tendal, B.; Nu¨ esch, E.; Villiger, P. M.; Welton, N. J., 2010: Effects of glucosamine, chondroitin, or placebo in patients with osteoarthritis of hip or knee: network meta-analysis. British Medical Journal 341, c4675. Weiner, H. L., 1997: Oral tolerance: immune mechanisms and treatment of autoimmune diseases. Immunology Today 18, 335–343.